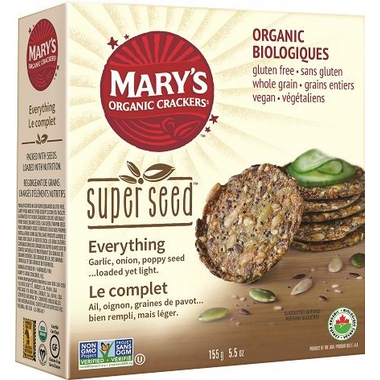 Mary's Organic Crackers Super Seed Crackers are a gluten free, organic, wheat free and non-GMO cracker, which are a blend of sunflower, pumpkin and poppy seeds! These crackers are a perfect stand alone, soy free snack that can also be combined with a variety of delicious treats. This product was manufactured in a gluten free, dairy free, and nut free facility. These are delicious. I love nuts and crunch and these have it all. Just a bit seasoned, not salty, perfect toasting. Try them.